A favorite picture. 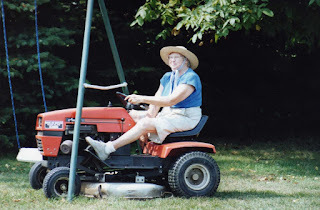 Mom in her straw hat riding the mower. How she managed to mow between the legs of the old swing set with a swing intruded on by the little red tractor is beyond me. This is the same woman who managed to back the car into the barn. Now she was maneuvering like a pro. Obviously, she would have done better with a compact car. Mowing the yard was a weekly event in the Loxley family. Every Saturday the mower came out along with our designated mowing duties. I vaguely remember the old push mower that had a big roller at the back. 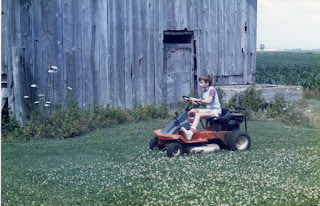 I was too little to push it, but when the first gas powered push mower came into being, I was thrilled. Now I could be part of the Saturday team. I had come of age. I mowed until the gas ran dry. Dad would lug the big can out to the yard refilling the tank. He pulled the rope and once more I was in business. At the end of the day, I would come into the house with grass on my legs and feet and my shoes tinged green. Never did I consider it a chore. I sang at the top of my lungs pushing that mower round and round the circle of grass surrounded by the gravel driveway. At first, Dad mowed around the trees, not trusting me to keep my feet from beneath the mower. Later, I would gain new trust and responsibility tackling the tedious as well as the mundane. When I married, we bought a mini-farm not far from my parents. My city-boy husband needed a riding mower. A transfer to Wisconsin from our little place on Teagues South Road meant that our new mower would not be needed on our tiny, new lawn. It was then that Mom and Dad found new joy in mowing. On one visit home, Dad gave my son permission to mow with the old rider. James mowed and mowed that day loving the fact that he was turned loose with a motor and a steering wheel. When he was finished, Dad told him to pull it into the barn. My town-raised son didn’t ask how to stop it, and his farm-born grandfather thought every boy knew how. I was watching when yelling came from the inside of the barn. Evidently, James had found the way to stop it was to run into the tractor in front of it. The old rider would give way to a newer model, the one mom delighted in driving. The children and grandchildren stood watching this matriarch beam tackling the yard she had mowed for decades. A picture was snapped and a memory captured. No portrait sitting could have produced such a precious picture for this photo would give future generations a glimpse picture of their grandmother who wore her sense of humor, her tireless energy and gave her family pure delight. Woman on Mower. A caption for a memory.